We have a Limited Edition Signed copy for sale which goes to supporting the U2TOURFANS project. 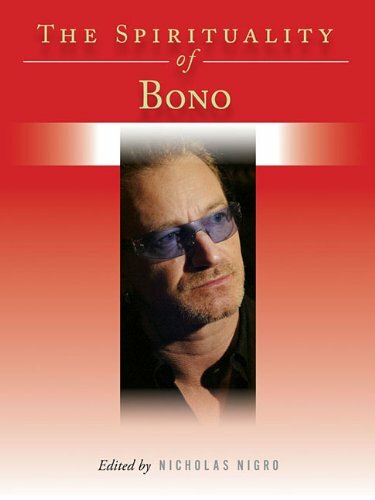 The Spirituality of Bono is a rich compendium of the singer's most thought provoking, uplifting, and persuasive words. Bono's insights, zeal, and good humor, too, are revealed in introspective, frank, and occasionally salty language. His spirituality and humanitarianism are heartfelt and will most definitely make readers think and, if Bono has his way, act to make this world a more just and humane place to live in. This series of pocket-size books taps into that cultural value of celebrity and presents, in a balanced and secular fashion, words of wisdom such celebrities have spoken. Series editor Nicholas Nigro weaves together insightful quotes and gathers them by theme ("Creativity," "Passion," "Intention"), offering texts from which readers can extrapolate their own meanings and, in turn, find added inspiration to live their best day-to-day lives. The Spirituality of Bono is a rich compendium of the singer's most thought provoking, uplifting, and persuasive words. Bono's insights, zeal, and good humor, too, are revealed in introspective, frank, and occasionally salty language. His spirituality and humanitarianism are heartfelt and will most definitely make readers think and, if Bono has his way, act to make this world a more just and humane place to live in.